Jerusalem and The National Anthem, and Walton’s Crown Imperial and Orb and Sceptre were given impressive renderings on our organs. 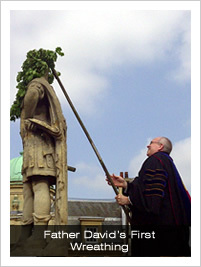 Earlier in the week we marked Oak Apple Day with the wreathing of the statue of King Charles on our Portico at Noon on Tuesday 29 May, followed by Holy Communion according to the Book of Common Prayer led by the All Saints’ Singers. 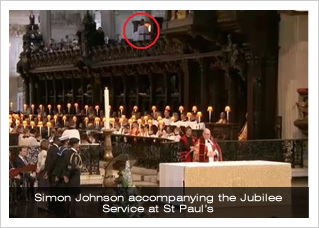 Two former Directors of Music here at All Saints took to the stage for the national events surrounding the Jubilee. 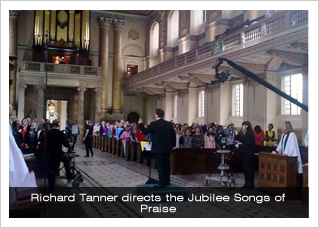 On Sunday night the popular BBC 1 television show Songs of Praise came from the Chapel of the Royal Naval College, Greenwich, where Richard Tanner is currently Director of Music. He conducted the hymns with aplomb. Today, the Jubilee Service at St Paul’s Cathedral was accompanied by Simon Johnson, who also provided a stirring arrangement of Guide me, O thou great redeemer for the service. 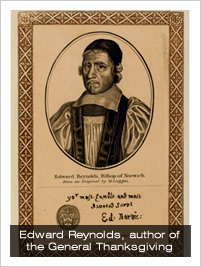 At the service The General Thanksgiving from the 1662 Book of Common Prayer was read; this Thanksgiving was composed by Edward Reynolds who was at the time Bishop of Norwich, but who had been Vicar here at All Saints.